Damascus, VA is affectionately know as "Trail Town USA". While visiting you have several options for your hiking and biking adventures. There are hundreds of miles of trails to enjoy. Choose to hike and bike a few miles or a few days. 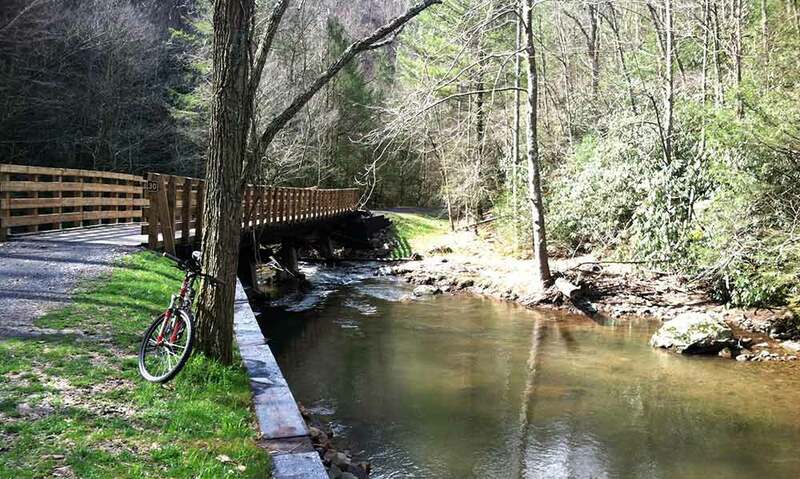 The Virginia Creeper Trail is a multipurpose trail converted from a abandoned railway and is now a part of the Rails to Trails Conservancy. The trail extends 34 miles and climbs over 2000ft on it way from Abaingdon, VA to Whitetop Station near the NC state line. Traveling the trail will lead you through the scenic communities of Abingdon, Alvarado, Damascus, Taylors Valley, and Greencove. Many trail riders choose to visit one of the Shuttle Services in Damascus for a ride to the top (Whitetop Station) and enjoy the relaxing 17 miles back to Damascus. The Appalachian Trail, or as many call it the "AT", stretches over 2100 miles from Main to Georgia. The trail passes through the middle of Damascus and you can recognize it by the "white blaze" markers along the trail. While visiting town you will meet several hikers catching a break or picking up supplies for the journey, the post office is a one of several package pick-up and drop off points for hikers. Overnight accomidations are also availiable for the weary travelers. If you want more than a "lesiure" ride this trail will provide it. Small streams and rocky paths are all part of this challenging 8 mile trail. The beautiful scenery will make this ride worth the sweat you will pour into it. Grab a shuttle (and maybe a MAP) at the Depot to begin your trip. Backbone Rock Recreation Area is just a short drive outside Damascus(approx 5 miles). The tunnel through the rock was drilled to allow railway access in 1901. Later the area was converted to a recreation area that includes Campsites,Pavilions, Restrooms, and a few trails. The main trail leads you across the top of the rock. The pavilions make for a great place to have a cookout with family or friends, children will love the water and the cool "swinning hole".